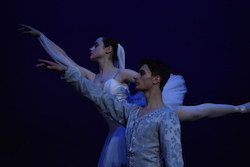 'La Bayadère'. Photo courtesy of Premier State Ballet. The Premier State Ballet has been a staple part of the Sydney Ballet scene for over 26 years and is known as a strong training ground for young pre-professional ballet dancers. It allows its members to get a glimpse into what it may be like to be working in a professional company in the future. They are exposed to traditional repertoire, have a place to hone their technique and acting abilities through performing in a production of full work on a yearly basis, and in the past, the company has covered many of the classics we know and love. ‘La Bayadère’. Photo courtesy of Premier State Ballet. The dancers are selected by audition from students already enrolled at The McDonald College. Once the students are selected, they rehearse on a weekly basis to prepare each year’s chosen repertoire. 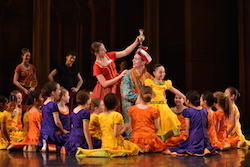 The students are led and guided by company director Joshua Consanguine, former principal artist with The Australian Ballet. This performance was led by cast members Eloise Moore as Nikiya, Charles Slater as Solor and Ruby Brazzalotto as Gamzatti. This trio of young dancers did a splendid job of embodying each of their roles and to tell the story, as well as taking on the technical challenges that also came with their individual character. As Gamzatti, Brazzalotto really displayed her strong acting ability and did not waver throughout the entire performance. The pas de deux’s Slater and Moore danced well with one another. La Bayadère is quite a mature story, and asking young teenagers to recreate this story’s love triangle is quite demanding, so the level of maturity in these dancers must be commended. Another dancer who stood out was Jordan Micallef, performing the Bronze Idol solo in Act III. In the Kingdom of the Shades, the female ensemble did a wonderful job with the famous arabesque entrance. Overall, the company’s production of La Bayadère was an enjoyable performance for a ballet lover. It is a great performance to expose little ones to as well, as it is an encouraging and family-friendly environment. There were also a few tiny dancers performing in one of the scenes, all aged about eight to 10 years old; they all looked like they thoroughly enjoyed being on the stage. So it is a good performance to take children to as their first exposure to a full-length ballet. The company has and will continue to mentor young dancers. There have been many who have come through Premier State Ballet who have been accepted into prestigious ballet schools and then moved on to world class companies. Some of the former alumni include Robert Curran, who danced with The Australian Ballet; and Serena Green, currently with Queensland Ballet. Most recently, Harrison Lee has graduated and moved on to further study at The Royal Ballet School. 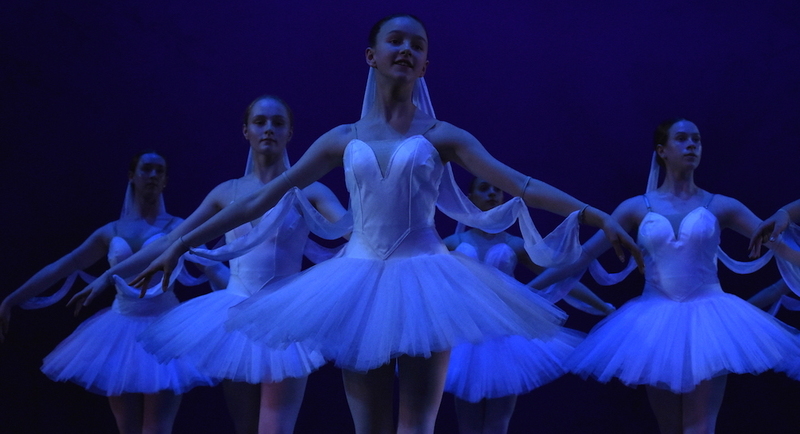 Audiences can look forward to seeing more of these young dancers pursue their dreams as professional artists. By Dolce Fisher of Dance Informa.